The National Dialogue for Healthcare Innovation (NDHI) was created by the Healthcare Leadership Council, an alliance of chief executives of the nation’s leading healthcare companies and organizations representing all health sectors. The purpose of NDHI is to bring together leaders from private sector healthcare, government, academia, business, and patient organizations to focus on issues affecting the course for healthcare’s future. Currently, NDHI is being utilized to develop a roadmap of actionable solutions to combat the nation’s opioid crisis. This effort included a national summit that took place on May 14, 2018, the publication of a compendium detailing multiple successful private sector innovations to combat opioid misuse and addiction, and the forthcoming release of consensus solutions. The NDHI initiative began in 2010 and directed its efforts toward the issues surrounding physician-industry collaboration. 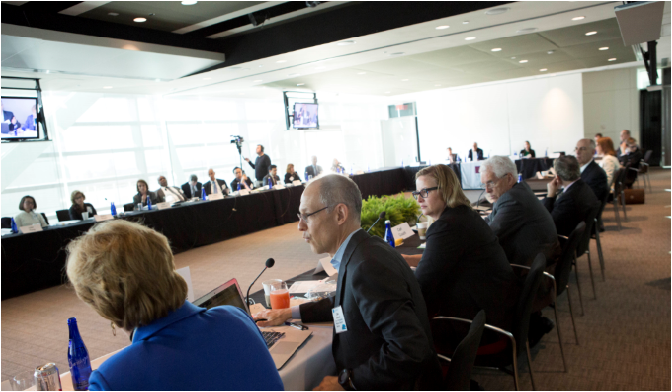 Through an NDHI Summit on the issue in Washington, D.C. and subsequent working group deliberations, a diverse array of organizations reached consensus on a statement of principles emphasizing the value of physicians, and industry working together on behalf of patients while underscoring the importance of transparency and researcher independence. In 2015, NDHI turned to focus on the importance of incentivizing innovation and elevating value in healthcare delivery and payment systems. A March 2, 2015 NDHI Summit at the Newseum in Washington, D.C. brought together prominent leaders from over 70 influential companies and organizations to examine barriers to health innovation in the status quo and how new payment and delivery structures can enable patient access to life-changing innovations while achieving greater affordability and financial sustainability.